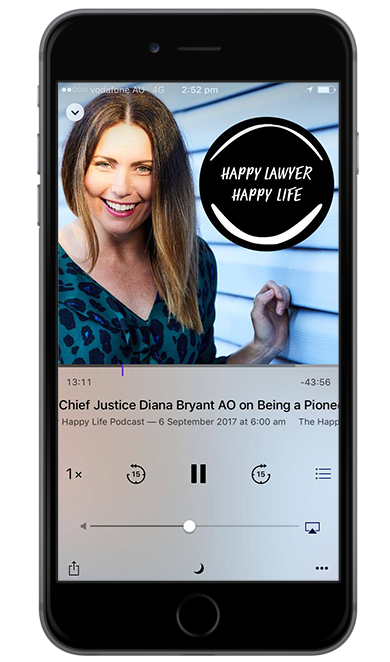 In this week’s episode of the ‘Happy Lawyer Happy Life Podcast’ I had the pleasure of interviewing construction lawyer Petrina Macpherson. Now Petrina is no ordinary lawyer (mind you this show is confirming for me that there really are no ‘ordinary lawyers’ anywhere). Petrina has a side life as a comedian! So yes this interview is full of laughs for all the right reasons. Petrina spends her career as a part of the Construction Law team at Minter Ellison here in Brisbane. She loves her firm, her role and her team. Her life in the law didn’t begin in construction work though- she instead found herself initially working in criminal and family law and I found Petrina’s insights on why she chose to move away from these areas into commerical and later construction law a great reminder that sometimes you have to keep hunting to find your ‘thing’ in law. Growing up in North Queensland, Petrina shared a very personal story of what inspired her to be a lawyer and the very early age of 8! But she chased down that dream and many more along the way. This was a beautiful conversation for me. We did speak law and of course comedy but Petrina had many more great insights on life, happiness and health that I suspect you will really enjoy as well. If Petrina was not a lawyer she would have been a stand-up comedian. Petrina grew up in Innisvale and completed her law degree at James Cook University in Townsville. How Petrina came to study law – turns out it was her dream since she was 8 years old! Petrina started her legal career in the areas of Family Law and Criminal law and her perspective on these two areas. Discovering she really enjoyed court work, Petrina moved into the area of commercial litigation and later became a construction lawyer. Petrina tells what is involved in Construction law and what she enjoys about working in this area at Minter Ellison. Petrina has a love for comedy and her journey to comedy started in a competition for the Queensland’s Young Lawyers. The experience of performing a stand-up set and what she loves about this aspect of her life. The science of laughter and it’s a contribution to happiness. How being a stand-up comedian has helped Petrina’s career in law. Fitness is so important and Petrina uses hiking as a way to keep her fitness up. Petrina does work with The Pyjama Foundation and finds huge value in working with children who need a helping hand. Wanting to learn a new skill Petrina has also recently started dance classes with her husband! Petrina’s perspective on happiness in and outside of the law.